ATV Albert Einstein backs away from the International Space Station shortly after undocking at 09:55 CET (08:55 UT) on Oct. 28, 2013, as seen in this space wallpaper. ATV Albert Einstein backs away from the International Space Station shortly after undocking at 09:55 CET (08:55 UT) on Oct. 28, 2013, as seen in this space wallpaper. 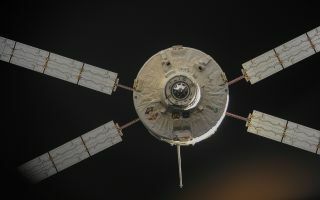 Albert Einstein is the fourth in the series of ESA’s Automated Transfer Vehicles that delivers supplies to the station, reboosts its orbit and frees up space on the orbital outpost when it undocks with waste. The spacecraft is scheduled to be sent into Earth’s atmosphere for a planned destructive re-entry over an uninhabited area of the south Pacific Ocean on Nov. 2.